The definition of futuristic is something that has to do with the future, or is ahead of the current times. 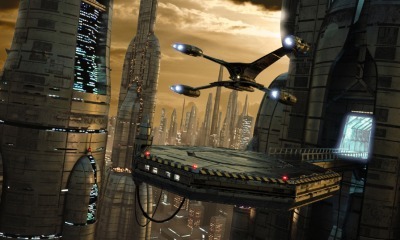 An example of something futuristic is a science fiction movie set in the year 3010. An example of something futuristic is a new fabric that keeps the skin cool. "futuristic." YourDictionary, n.d. Web. 20 April 2019. <https://www.yourdictionary.com/Futuristic>. Of or relating to the future. a. Of, characterized by, or expressing a vision of the future: futuristic decor. b. Being ahead of the times; innovative or revolutionary: futuristic computer software. Of or relating to futurism. Of technology, a concept, etc, advanced so far beyond that which is current as to appear to be from the future. Epcot Center is half futuristic, half a celebration of multiculturalism as guests explore various country mock ups in the World Showcase, as well as exhilarating science-based attractions in Future World. Impulsion: Housed in the "Others" category, Impulsion, a futuristic frame that almost looks like a mask for the eyes that's been made out of lasers, is available for purchase in the colors of black, blue and even yellow. Timex Men's Expedition Adventure Tech Altimeter Barometer Watch (Model T41531) - The Timex Men's Expedition Adventure Tech Altimeter Barometer Watch has futuristic styling with a distinctive gray and orange band. It is often said that art mimics life, but in the case of robots, it seems life mimics art as the robotics of today try to catch up with the futuristic renditions available to generations of sci-fi enthusiasts.